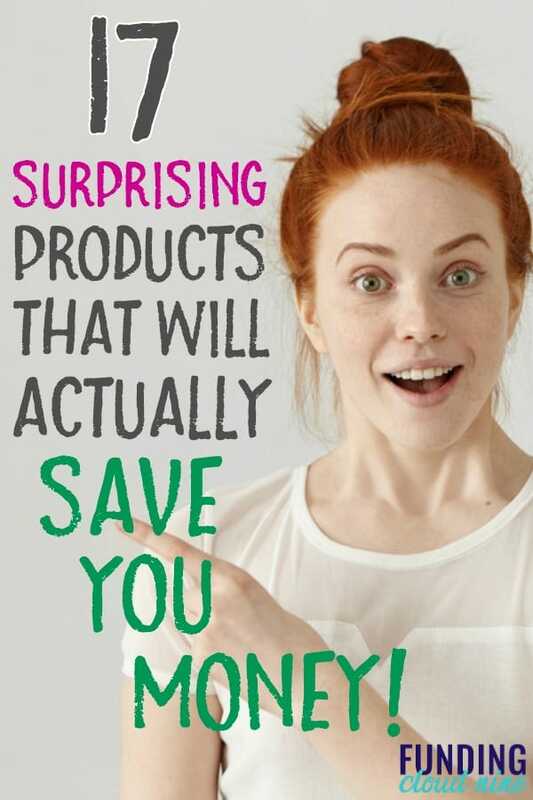 These money-saving products and gadgets will make your wallet grow and help you live your best frugal life! It’s hard to wrap your mind around spending money to save money. It just doesn’t make sense. When you buy something, you see the money leave your wallet (or you bank account). And I’ve literally never seen money hop back into my wallet (actually, now that think about it, that’s a lie…ebates is my jam!). But for these gadgets that I’ve listed below (ALL of which I own), you will end up saving money in the long run. These gadgets all pay for themselves, and in most cases, you will even see a return on your investment. That means that you will save more money (over time) than the cost of the product. Sounds pretty great, right? Let’s get started with some of my favorites! I know what you’re thinking. Why buy a mini-oven when my kitchen already comes with the a conventional oven? Buying duplicate products seems a waste of money. That was my first thought too. But the energy it takes to heat up a toaster oven is significantly less than your kitchen’s oven. In other words, it’s way cheaper to use your toaster oven than your conventional oven. If you are only cooking a small portion of something, you’ll save money with a toaster oven. I use mine multiple times a week for side-dishes (brussel sprouts and potatoes are my favorite), snacks (I love those small pizzas! ), and single serving desserts (my specialty is homemade s’mores). A lunchbox has an amazing return on investment. If it encourages and reminds you to pack your lunch instead of buying, you will probably make your money back in one week! Then everything after that is savings. My criteria for a good lunchbox: big and washable. I know this money saving kitchen gadget doesn’t surprise anyone. It’s a classic. For minimal effort and time, I can get several days’ worth of meals from a crockpot (or Instapot) recipe. That means I’m not spending money on fast food or at restaurants. In my state, all stores charge 5 cents for each disposal bag you use. That can add up, especially if you go to the grocery store once a week! I recently purchased these reusable grocery bags and I loveeee them. I wish I had purchased them sooner. They are big so you can carry a lot groceries in them, but they fold up into small pouches that you can carry in your purse or leave in your car. This is probably my biggest money saver on the list (or maybe it’s just my favorite). Good quality food storage containers will save your leftovers longer. I’ve gone through so many different types of storage containers, but I recently purchased these and they just might be my favorite. This is the weird one on the list. And it’s very possible that it only saves me a ton of money, and might not actually help you. But I figured I’d share it anyway. So I have three of these awesome collapsible colanders with a base. You see, I have this bad habit of buying fruits and vegetables with the best of intentions…and then never eating them. It’s a total waste of money. However, since I’ve purchased these colanders, I immediately wash my produce when I get home from the grocery store, drain the water, put on the base, and just stick in my fridge. Having washed fruit and vegetables in my fridge encourages me to eat them. No more moldy food for me. No more wasted money for me. Paper towels are expensive, and they seem to disappear in my house. I have been using these microfiber cloths for a while, and it feels good not to throw away paper towels (from a money and environment perspective!). Speaking of wasting money on paper towels, I always use these microwave covers instead of covering my food with paper towels. A simple, easy cookbook is guaranteed to save you money. Because isn’t cooking at home the #1 rule in frugal living?? I love the Budget Bytes cookbook (she’s featured in my best food blogs post). Water is cheaper than any other drink. Knowing that I have good tasting water at my disposal helps me stay away from sodas, seltzer, lemonade, ice tea…you get the picture. Here’s the water filter pitcher I have. This is a no-brainer. If you have a smart phone, which can cost $1,000 or more, you need to protect it! This is the screen protector I use. And it has survived more falls that I care to admit. Using less water = lower water bill. An energy efficient shower-head can reduce the amount of water you use without affecting water pressure. You won’t notice a difference! Want to hear one of my biggest pet peeves? When people (ahem, my husband) unplug electronics when not in use. It frustrates me to no end. I think there is something wrong with my computer because it won’t turn on (but really it’s just unplugged). The vacuum cleaner won’t work because it hasn’t been charged. Ah! Clearly first world problems here, but an energy efficient power strip has solved our problems. It turns off the power of electronics when they aren’t in use. It helps save on your energy bill. You should try this in your living room for your TV (and associated electronics). I personally use it in my office for all my computers and electronics in there. I actually prefer the bright light of LEDs. As our incandescent light bulbs burn out, we are replacing them with energy efficient LED light bulbs that last longer. I love a warm house, but my husband prefers living in an igloo. I’m not exaggerating. It has gotten to the point where my nose and ears are red from the cold. I purchased a tower space heater to use in my office, and it has the added bonus of saving money because we are only heating one room instead of the entire house. Ok, quick story time. When I was getting married, I had a hair stylist come to my hotel room and do my hair and my bridesmaids’ hair. Our hair turned out amazing, but the next day I found out he had left a hot curling iron on the hotel floor, and it burned a hole in the carpet! Luckily I didn’t get charged for it, but that could have been an expensive bill. Moral of the story: our hair straighteners and curling irons can do a lot of damage. Having a heat resistant mat will protect my counters (and floor if my straightener ever falls). Whaaat? Why do I have a “luxury” item on my list? I’ll tell you the exact reason these velvet hangers have saved me money. I threw away all my old plastic hangers and purchased 50 velvet hangers. Just 50. I purged all the clothes that didn’t fit on the hangers, and I don’t purchase any new clothes unless I get rid of something I already have. A lot of thought goes into buying every new article of clothing, because it has to be better than something I already have. This little trick has saved me so much money. And I love that my closet isn’t overflowing anymore. Sometimes you have to spend money to save more money. You have to make an investment to see a return. I listed a few products that I absolutely love, that have the added bonus of saving me money every month. I have found these products well worth the investment. What products or gadgets have you purchased that save you money over the long haul?